HomeCOMMENTARYChina … and Macron’s U-Turn – have they clued in yet? Less than a week ago, President Macron was lambasting Italy for signing agreements with China in the context of their New Silk Road, alias President Xi Jinping’s Belt and Road Initiative (BRI); in the same breath he was criticizing China for attempting to undermine Europe with new trade, individual-country deals under the pretext of BRI. However, Italy, also scolded by Brussels for her single-handed deals with China, was, in fact, the first G7 country for signing a number of contracts with China to use Italian ports under the BRI, making Italy also the first official EU partner of China’s BRI. In his zeal of becoming Europe’s new king, Macron also called on all EU members not to go their own way with China, but to jointly negotiate with China “new deals” under the BRI. A joint EU to be strong and equal to the economic and trade behemoth, China. Indeed, solidarity is always ‘good’- but Europe is the last bit of Mother Earth’s territory that has ever shown any solidarity and cohesion among her neighbors and co-members of this illustrious non-union club, called the European Union. Yet, surprise-surprise! On President Xi’s next stop, Paris, arriving from Italy, Macron rolled out the red carpet for the Chinese President and, according to RT, went on to sign billions worth of new contracts with the Asian leader. If this looked like a Macron U-turn, it was a Macron U-turn. As an afterthought, he invited German Chancellor, Madame Merkel and EU President Juncker to Paris for a photo-op under the Arc de Triomphe – just to make sure his about-face was not to be misinterpreted. President Xi also signed a multi-billion-euro deal – may be as much as €30billion – for some 300 passenger jets from Airbus. Though Airbus is a European venture, its main manufacturing plants are in France. This is an especially hard blow to Boeing, after the company’s 737 MAX disasters. Weakening Boeing is also weakening an important US military contractor. As was to be expected, Washington didn’t like Italy’s moving closer to the East by signing several BRI contracts, and even less so, while the EU, represented by Jean-Claude Juncker, Angela Merkel, Germany and Emmanuel Macron, France, were welcoming President Xi today in Paris. Showing a little sympathy to friend Trump, Merkel observed to Reuters, “We, as Europeans, want to play an active part and that must lead to certain reciprocity and we are still wrangling over that a bit.” – Showing Washington that not all is lost will surely give the empire a grain of hope. Exactly 6 years ago, President Xi Jinping launched the BRI, the most ambitious and largest economic development project in recent history. On President Xi’s second state visit to Germany in March 2014, he specifically offered Madame Merkel to become (at that time) the western-most link for the BRI. But Madame Merkel just snubbed the proposal and let it go. She was too close to Washington, and, who knows, maybe received marching orders from Obama and his handlers, to leave her fingers from tightening relations with China. As the Chinese are not pushy, Mr. Xi went home and pursued this massive project further. Within the next 30 years at least, it will build multi-trillions of Chinese Yuans-worth of infrastructure, interconnected research and education centers, industrial development, facilitate cultural exchange – it will build bridges among people. The BRI is so important that the Chinese National Assembly decided in 2017 to incorporate it into the Chinese Constitution. Today BRI spans the globe with some six land and maritime routes. More are under preparation. BRI is not to invade and take over the world, as the west would like you to believe. The New Silk Road is instead promoting a multi-polar world. It will pave the way towards a new world order, but not the one the Rothschilds &Co. are dreaming about, but one that promotes equal partnership and solidarity among countries. It is amazing: the West has been asleep for 6 years, or didn’t want to see. Maybe the Washington-driven war machine simply thought it would go away. But it didn’t and won’t. China has the world’s strongest economy according to Purchasing Power Parity (PPP) indicators (that’s all that really counts), surpassing the US in 2017. With the BRI and an ever-stronger currency, the Yuan, due to a stable and steadily growing distributive economy, and in a military and strategic alliance with Russia, China is literally unbeatable. Hence, as basically a last-ditch effort, Washington’s multiple attempts at trade wars. It’s a publicity stunt to make the world believe the US is still calling the shots. In reality, the New Silk Road is most likely the vehicle to drive the United States warrior arrogance into the ground. Good riddance. And let’s not forget, BRI is intimately linked with Russia, not only physically as in transport infrastructure, but also strategically for purposes of economic development of henceforth forgotten and neglected countries and regions. So far, the West has not even reacted to this “imminent threat”, as perceived by Washington, the Russian haters. If they would add Russia and China together as the new Silk Road front, they would pee in their pants – as they may realize their days of never-ending treachery and lies will soon end. Therefore, better that the Ostrich pulls only one eye out of the sand, blinking at China. Lying to themselves, and of course to their people, is just one more nail in the coffin of the West. We may not be there yet, as war threats and attempts at regime change from the neofascist Trump team are still very much “on the table”. But with Russia’s far greater superiority in military power and the Chinese economic masters, this table may soon be symbolically blown apart, meaning, will the commanding and reigning elite living a lush and egocentric lifestyle really want to run the risk of being out-nuked? – Because a new war will not just be played out in Europe, like the last two WWs; nor will New Zealand offer a safe haven for those elite and super rich, who have already secured their properties in this far-away land. – Don’t think so. They, the dark state elite who pull the strings, rather live in safe world and enjoy their bounties stolen over hundreds of years, as long as they last, even under a Russia-China and multipolar SCO (Shanghai Cooperation Organization) sponsorship. When that recognition dawns on Western minds, that all that counts is economics – economics that may bring more equality, a better life and harmony among nations, and more prosperity for more people on this planet earth. Did Mr. Macron and his European counterparts just see the light? Did he realize that being the king of vassal Europe is really meaningless and that it’s high time to jump the sinking boat? Only the near future will tell. Another scenario is that China has long realized the futurelessness of the EU, and instead of banking their trade agreements with a potentially dead body, they approach country by country, Greece, Italy, France, Germany – who is next? – Because, even with the collapse of the European Union, the 28 countries must and will survive. So, trade agreements with each one of them individually have an indefinitely higher value than signing up with a block of nations lacking solidarity, uncoordinated, even in some cases hostile-to-each-other – with a fiat currency that is doomed, as it will never survive in such a non-union constellation – without even a Constitution pointing to a common vision. Why the Europeans can’t see that for themselves and run away from this disaster called Brussels is a miracle to me. If a Martian would watch the human behavior on our Mother Earth, he, she or it would laugh no end at our abject schizophrenic behavior – but at the same time with tears of sadness, as humanity is hell-bent on self-destruction. Well, Roi Macron will not let go; he is not (yet) allowed to let go. His paymasters, those that put him there, the Rothschild financial clan & Co. have not gotten enough out of him yet in terms of milking Europe to the bones. How much more can Macron’s naïve pathological egocentricity still give? 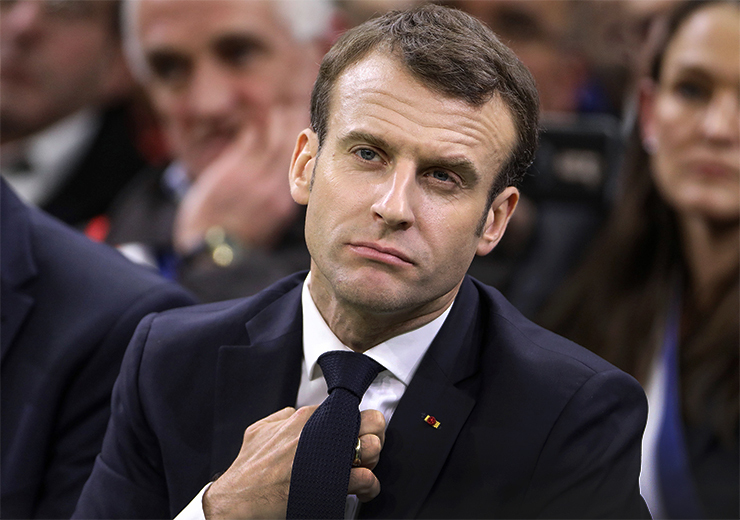 – By launching the military, the first time since 1948, with live ammunition against harmless, unarmed protesters, the Yellow Vests, his French co-patriots (although he is an Über-French, he is a wannabe European king), is maybe the last nail in Macron’s coffin – figurately speaking. Those black-hooded “protesters” who plant the violence, burn down bank entrances, break windows and loot shops, are nothing less than paid agents-provocateur. You may have noticed, in the hundreds of demo-videos circulating on internet, the police leave them pretty much alone – orders from the Macron regime. Will the military be loyal to deceitful, despicable Macron, or to the nation, i.e. to the people? That remains the question, as fissures within the military are already noticeable. So, Macron’s about-face or U-Turn, after having scolded Italy for going it alone instead of ’collectively’ with the EU, may be by orders of the financial monarchs who forced him with a ton of false propaganda into the French Presidency – and who may now also see the light: Europe is no longer a viable bet.